As competition and technology continue to evolve in today’s industrial and manufacturing industries, companies are faced with the ever-increasing challenge of reducing costs and improving efficiency while maintaining production quality. These manufacturing companies often have multiple sites spread across large geographic regions, each with thousands of maintenance, repair and operations (MRO) spare parts on hand to keep operations running. In such large organizations, several different employees enter items into various enterprise asset management (EAM) systems at each site, with little or no standard guidelines, and often in multiple languages. Over time, this lack of standardization causes materials data to become inconsistent and inaccurate, resulting in many negative effects that can be felt throughout all units of the business. These inefficiencies can cost companies significant time and money, while preventing them from making critical data-driven decisions. In order to transform corrupt data into consistent quality data, a data-cleansing process must be implemented to create one common corporate catalog that can be maintained throughout the entire organization. While the data-cleansing process may appear very simple in nature, it requires a very unique and specialized set of software, people and procedures. Some data-cleansing companies pride themselves on efficiency and speed through the use of automated software, but in reality, there is no software application that can accurately cleanse mass data files without human intervention. The data-cleansing process is actually much more detailed, and for the most accurate results, requires the use of automated software applications combined with the involvement of cleansing specialists to ensure consistency, accuracy and efficiency. To illustrate the data-cleansing process from start to finish, it has been broken down into nine steps. While every project is different based on specific customer requirements, these nine steps cover the standard procedures involved in every data-cleansing project. Using automated software, the manufacturer name and part number are extracted and segregated from the unstructured free text description. Once segregated, the manufacturer name and part number are corrected and standardized, ensuring each unique manufacturer name and part number maintains one consistent structure throughout the entire database. Following the segregation and standardization of manufacturer names and part numbers, a noun-modifier dictionary is used to assign the correct identifier and descriptive properties for each item. As illustrated below, using the noun-modifier dictionary, each item is assigned a noun-modifier pair, where the noun is the primary identifier and the modifier is the secondary identifier. Each noun-modifier pair also contains on average five to seven associated attributes, which further describe the characteristics of that item. After standardizing and populating information provided in the customer’s raw description, the remaining attributes are populated using internal and external tools such as the master parts library, which contains millions of pre-standardized items. An online research tool assists in the search and collection of additional part information. Using these powerful tools, item descriptions are accurately and efficiently enhanced with information retrieved directly from manufacturer catalogs. Once all items have been correctly described by a noun, modifier and corresponding attributes, they can be assigned customer-specified classification codes. The classification codes are typically used for commodity segmentation, spend analysis and other custom reports, enabling companies to leverage purchases and gain insight for improved procurement-related efficiencies. 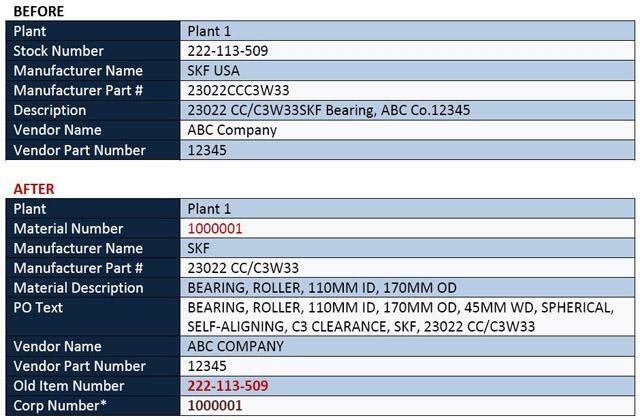 After cleansing and classification is complete, duplicate items within the database are identified by direct duplicate (same manufacturer name and part number) or by form-fit-function (different manufacturer name and part number but identical according to type, size and material). Once duplicates have been identified, they are assigned one common corporate part number, descriptions are duplicated to appear identical throughout the database, and the items are flagged for customer review. Due to the emphasis on quality and consistency, the next step involves a final human review of all items, typically conducted by an assigned project leader or dedicated quality-control person. The quality-control process ensures that every item follows proper format and nomenclature according to pre-defined customer standards, while verifying that enhanced descriptions are correct, accurate and complete. On average, 10 percent of the materials database is usually found to be review items, meaning items lacking critical information for accurate part identification such as manufacturer name or part number. During the data-cleansing process, these items are flagged and compiled into a customer review list. The review list is returned to the customer, who must then physically locate the item within the storeroom and record the necessary part information to be added into the material master. Once the missing information has been collected for all review items and the entire cleansed database has been approved by quality control, it is deemed complete and transferred to the IT department. At this stage, IT specialists format the data to the customer-specified enterprise resource planning (ERP) system and extract it into a return file. The formatting stage is critical to achieving the desired end result, as every ERP system has its own unique layout, headers and field limitations. Once the entire data file has been cleansed, standardized, enhanced, de-duplicated, reviewed and formatted to the customer’s ERP system, it is electronically delivered to the customer. At this time, the data can now be uploaded directly to the customer’s ERP system. From a long-term perspective, quality materials data is the key to maintaining operation costs and efficiencies. This process does not end once the data-cleansing project is complete. Maintaining ongoing data quality requires a strict set of catalog management procedures to ensure accuracy and consistency as new items are added and existing items are modified or suspended. Most data-cleansing companies offer some type of catalog management software or service for customers to maintain the quality of their cleansed catalog. However, unless the customer is able to dedicate an internal resource to manage the catalog, outsourcing this activity to the experts who originally cleansed the database will always deliver the best results. Jocelyn Facciotti is the marketing manager at I.M.A. Ltd., a company specializing in MRO data cleansing and related services. For more information, visit www.imaltd.com or contact info@imaltd.com.